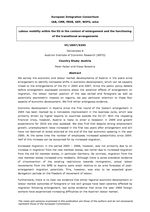 We summarise the available evidence on the extent, composition and effects of migration from the NMS to Sweden after 2004. Sweden was the only EU State which in 2004 introduced the full Community rule on the free movement of labour for NMS nationals with no restrictions regarding access for social benefits. Despite this, the inflows from the NMS to Sweden, while increasing relative to their initial levels, have been lower than to other European countries (the UK, Ireland, and Norway). Most NMS migrants come to Sweden from Poland and the Baltic States. Compared to the pre-transition levels, the share of females in the NMS migrant inflows substantially decreased, reflecting declining importance of the health care sector in NMS migrant employment. There is no evidence that NMS migrants are attracted to Sweden by generous social benefits.